Save valuable time by not having to hunt between different applications and by being able to make pinpoint data conversions! so you can see your PDF document. 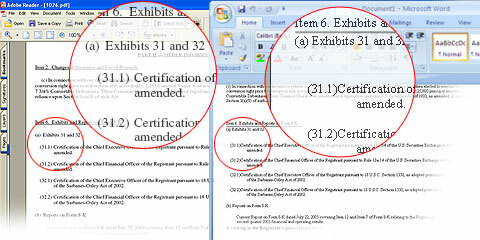 Able2Extract’s PDF viewer also allows you to specify the exact amount of PDF data you want to convert. It can be as little as one table on one page. PDF converters without a PDF viewer are limited to only converting a page at a time. This results in the converted data needing to be cleaned up post conversion. With Able2Extract, you don’t face this problem! This can be a lifesaver when you only want to do such things as convert one table from PDF to Excel or convert a paragraph of text from PDF to Word. 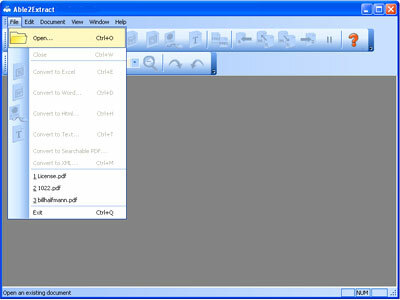 options that make it even easier to select the PDF data you want to export into another format, such as Word or Excel. The Table Selection format lets the user select row by row and select all of the columns of data on a page at once. This is a good option when a user would like to capture a whole table. The Column-by-Column Selection allows the user to select row-by-row and column-by-column. This option provides maximum control for the user and results in the user being able to select as little or as much data as they would like. Thus, when converting a table from PDF to Excel, the user can select on the columns of data they want, should they not want to select the whole table. Able2Extract has been dubbed by many as the ultimate conversion utility because it offers more advanced PDF conversion output quality and more total conversion options than other products on the market. Able2Extract delivers top quality PDF to Excel conversion output. Converting PDF to Excel with Able2Extract results in PDF data that is in a table format being converted into formatted Excel spreadsheets. The result of the PDF to Excel conversion is workable data in Excel that can be analyzed using Excel\’s powerful analysis spreadsheet functions. Thus, tabular data, including numerical, that was previously inaccessible for analysis in the PDF format can be transported into formatted Excel spreadsheets where it can analyzed using Excel’s powerful spreadsheet tools. The PDF to Word conversion option within Able2Extract lets you make changes and edits to your PDF documents in the familiar MS Word format. 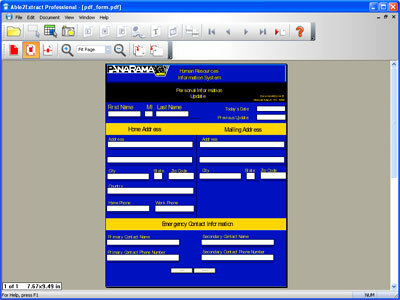 Graphics, text flow and layout of the PDF is preserved. is now accessible within Microsoft Word. when converted from PDF into the Word format. 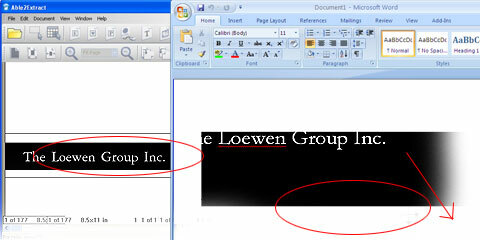 Graphics from the PDF are transported into Word. Preserve vector style graphics as editable objects within Word. 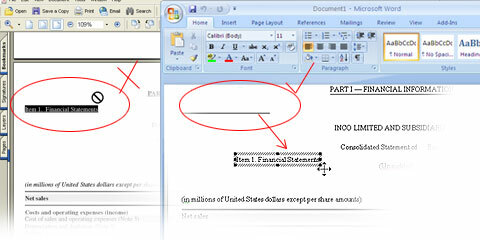 Using Able2Extract’s PDF viewer, you can view and select the form that you want to convert to Word. 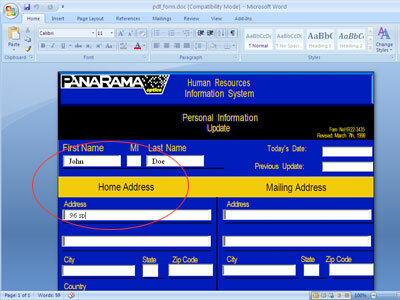 Able2Extract lets you convert the PDF Form into MS Word where you can then complete the form in the fields in Word. PDF to PowerPoint (PPT) Need to get that PDF information into PowerPoint for your next presentation. Well, our PDF to PowerPoint conversion will do the trick. Graphics and text from the PDF come through in PowerPoint. PDF to HTML For those users wanting to take their PDFs and create HTML documents for placement on the Internet, Able2Extract\’s PDF to HTML conversion will do the trick. 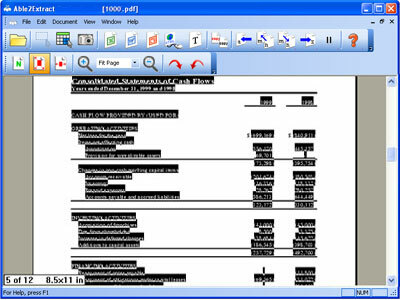 The output HTML retains the graphics of the PDF as well as the text. PDF to Image Formats Able2Extract gives users the ability to select images in PDFs or whole pages and then convert that data into the most widely used image formats, including TIFF, BMP, JPEG, PNG, and GIF. PDF to Text Able2Extract lets users take the text from their PDF and convert it into a text document quickly and easily with one touch of a buttom. This is great for users needing their textual data in .txt document. XPS Conversion XPS stands for XML Paper Specification. It is Microsoft’s new electronic paper format that is designed to compete with the PDF. Able2Extract now has XPS conversion capabilities, which allows users to convert XPS documents to Word, Excel, PowerPoint and more. HTML to Excel Many users have a need to transport tabular data found on the Internet in HTML format into formatted Excel spreadsheets for analysis. The Able2Extract’s HTML to Excel conversion option provides such a solution for these users. Simply save the HTML file you would like to convert, open it in Able2Extract and then convert it into a formatted Excel file for analysis. 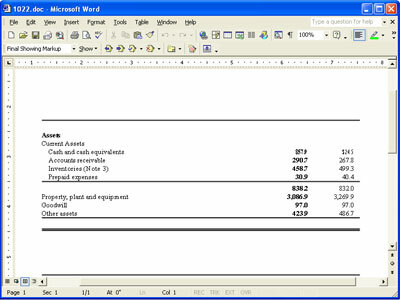 Text to Excel Financial statements for companies are frequently posted in Text format. The Text to Excel feature within Able2Extract lets users take the data from these text based financials and place them in formatted Excel spreadsheets. 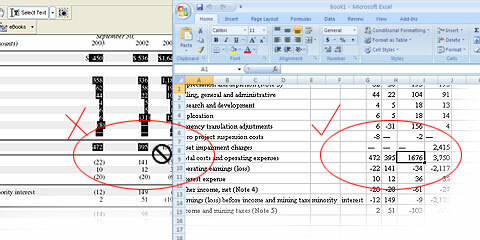 The Text to Excel feature is not limited to financial statements, that is but one example. Any text can be converted to Excel using Able2Extract’s Text to Excel feature.